History, Hip Hop Concentration, B.A. Students majoring in history must complete a minimum of 42 semester hours of courses beginning at the 2000 level, including History 1100, at least one seminar in history. The history minor must complete a minimum of 21 semester hours of courses beginning at the 2000 level, including History 1100 and at least one seminar in history. The department also offers certification in secondary social studies. Students seeking teaching certification also must complete a minimum of 42 semester hours and the required education courses. Students must have a 2.0 grade point average in their major and a 2.0 grade point average overall to successfully graduate from the program. Complete a minimum of 120 semester hours with a cumulative grade point average of 2.0 or higher. 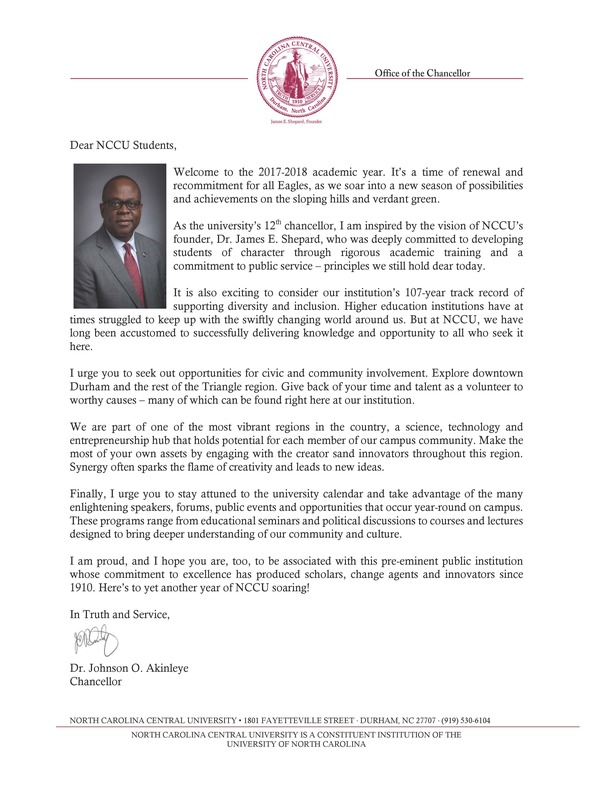 The last 30 credit hours must be completed at NCCU. Students must complete the General Education Requirements required by the University. See the “General Education” section in this catalog. HIST 2000 Historical Writing and Literature WI (must be taken in sophomore year). Two courses from the following areas. No more than one course in one area: African History, European History, and Latin American History. HIST 3180 History of France since the Enlightenment. One seminar course from HIST 4010 , HIST 4020 , HIST 4040 , HIST 4050 , HIST 4060 , HIST 4070 (must be taken senior year). At least 18 hours from any other 2000 level or higher undergraduate course. In courses A-F students must earn at least a grade of “C”. “D” or “F” grades must be repeated. A minimum GPA of 2.0 in the major and overall is required for graduation. The Hip Hop concentration provides students with a solid introduction and broad understanding of the origins and developing of the forms of expression that make up hip-hop cultures throughout the world: hip-hop dance, geography, psychology, mass communications, english, rap music, graffiti/tagging, fashion, business, and film. The concentration introduces students to the main themes represented in hip-hop cultures: appropriation and defense of spaces, mixing of different cultures, migrations, multilingualism, race, class, gender, religions, sexuality, nationality, politics and the economy, and, the search for identity. Credit Hours: Students will be required to take a total of 12 credit hours in the interdisciplinary courses listed for the concentration to meet the requirements for the concentration. Students may select 9 hours from the list below to complete concentration requirements. ** Placement scores will determine if students are required to complete MFL I or II before MFL III and MATH 1000 before the GEC Mathematics requirements.